Marla is a door hanger (no legs...with a hanger on back for hanging). Since I ran out of space on my walls, shelves, etc., I designed this door hanger this size so it would almost fill up your door! She measures app. 44" long. 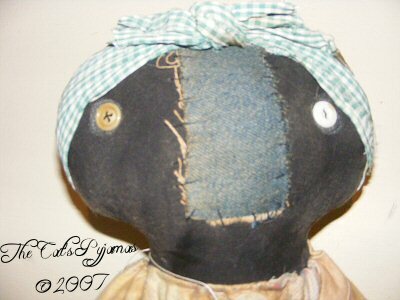 Mad eof painted and anqtiqued fabric with a really old & grungy button at her neck and a denim nose patch! She's holding a little bunny too. 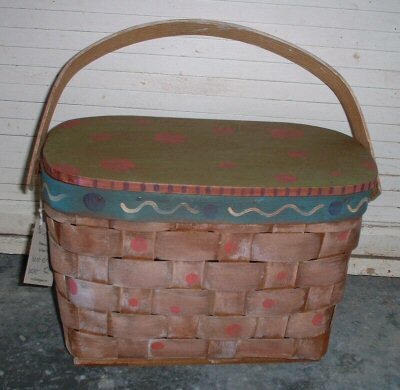 Here's a vintage basket purse that I painted in fun spring colors! Measures 10" wide x 7" tall x 5.75" deep. Signed & dated original.